This article was originally written for players in my own LotFP campaign, set in the English Civil War, starting with the England Upturn’d module. Lamentations of the Flame Princess is distinguished from other D&D variants in that it uses a silver standard. As per the main rulebook, 1gp = 50sp = 500cp. What does this mean in actual English money? That is, the old, pre-decimal pound sterling: 1£ = 20 shillings (s), 1s = 12 pence (d). But at this point, the pound sterling and shillings alike were really units of account – not actual coins. Even where coins existed with these “face values”, the face values were generally overlooked in favour of the metal value of the coin (which was often debased by the government – and during the civil war there were two governments in effect doing the debasing!). The basic coin is the silver piece – the silver penny. In theory it should be mostly silver although it is occasionally debased but we’ll overlook that for the purposes of playability. Likewise there were two pence coins, groats, six pence, although none probably as commonly circulated as the penny, and we’ll also overlook them. These are primarily minted at the Tower of London, and even under Parliament’s control during the war, the coins are minted with Charles I’s face on them. Coins are still hammered at this time, so they are not always perfectly round and shaped as modern coins are. An example is shown below. We can take the silver penny as having a concrete value in game terms – 1sp. There were gold crown coins minted with a face value of 5 shillings (confusingly there were some silver crowns too but let’s ignore them). These were by far the most common “gold coins” and are almost never seen. Gold coins are the currency of pirates! Well, that and international trade. 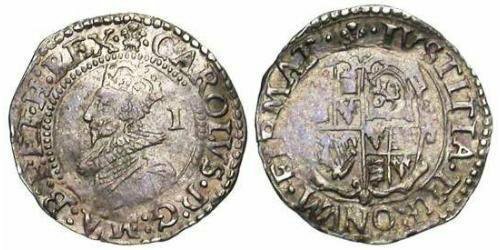 There are double crowns (10 shillings – example below), unites (20 shillings = 1£), double unites (40 shillings = 2£) and the King even mints some triple unites (60 shillings = 3£) at the mints he controls at Oxford and Shrewbury from 1642 to 1644. We will assume that most gold coins encountered are crown coins, with a face value of 5 shillings (60d) – this is the denomination closest to the Lamentations 50sp = 1gp. In any case, we can assume currency debasement will make the value of any gold coin “even out” to 1gp. All silver and gold coins minted by the King and Parliament alike feature a “head” side which shows the King’s head encircled by “CAROLUS DG MAG BRIT FRAN ET HIBER REX” – abbreviated Latin for “CHARLES BY THE GRACE OF GOD, OF GREAT BRITAIN, FRANCE AND IRELAND KING”. Coins minted by the Parliament usually make the King look older for some reason. Usually the “tails” side shows the coat of arms. Along the edge of the tails side of the penny is usually printed the phrase “IUSTITIA THRONUM FIRMAT” – Latin for “Justice Strengthens the Throne”. Other silver and gold coins may replace this phrase with “CHRISTO AVSPICE REGNO” – “I reign under the auspices of Christ”. Larger coins minted by the King during the early years of the war replace the “tails” side with a part of Psalm 68 “EXURGAT DEUS DISSIPENTUR INIMICI” – “Let God arise and His enemies be scattered”, and most importantly, what amounts to the King’s “campaign motto” – what he promises to uphold if victorious in the war: “RELIG PROT – LEG ANGL – LIBER PAR” – or “The Protestant Religion, the Laws of England, the Liberty of Parliament”. So these are the “official” coins. What is a copper piece then? 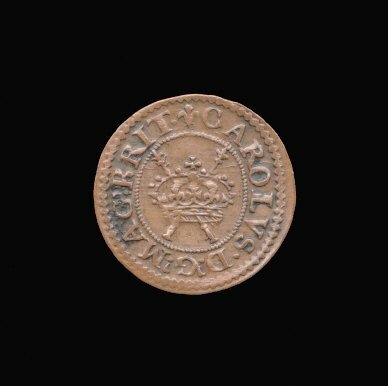 Generally it amounts to a local trade token produced by a guild redeemable for real money, or even a silver coin cut into smaller pieces, or perhaps a “siege coin”, but they may also be copper farthings (value 5cp). 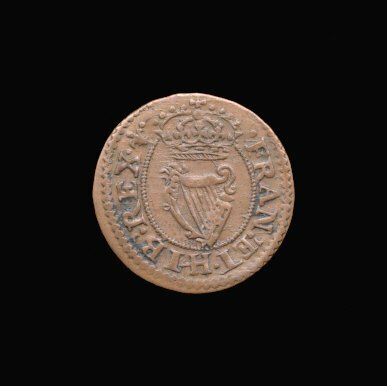 These farthings were not produced by the Royal Mint, but by aristocrats who were granted (or bought) the privilege of minting farthings from the King, under patent (they can be called patent-farthings for this reason). This started in the reign of King James I, and continued under Charles I. They are small with simple designs usually featuring crossed sceptres, crowns, roses, harps, and other devices associated with the King (example shown below). They say “CAROLVS DG MAG BR” on one side and “FRA ET HIB REX” on the other – “Charles by the Grace of God, of Great Britain” / “France and Ireland, King”. They were heavily prone to forgery, as were local trading tokens, so 10cp = 1sp is quite a reasonable exchange rate because people would generally honour a lower value than the face value. 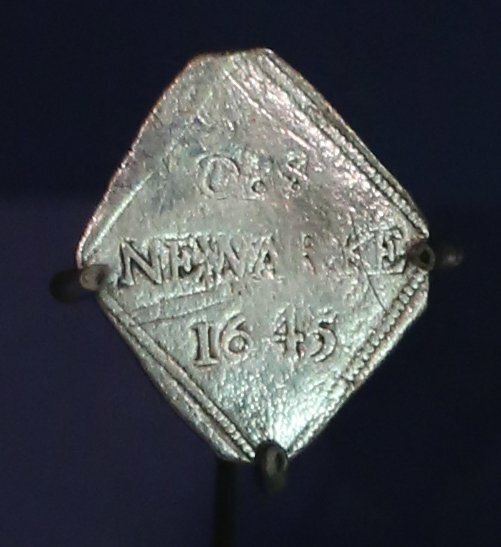 Finally, as the war goes on, there are more and more “siege coins” minted during a siege. They were generally made deliberately not to resemble “normal” coins and would be redeemed later. An example from the Siege of Newark is shown below. Cool and interesting write-up especially as money during this time is so confusing with all the weird names and limited edition? coinage.